This wine embodies the fusion of Victoria Beckham (formally known as Posh Spice), the elegance of Princess Kate and the voluptuousness of Marilyn Monroe. Lusciousness blended with bold ripe fruit. Notes of Italian leather, Cuban cigars and cold-brewed coffee lead to firm tannins. Velvety texture and a satin finish leave you wanting more. Sara cut her teeth in the wine industry as a seasonal member of the Kendall-Jackson Winery staff during high school and college. 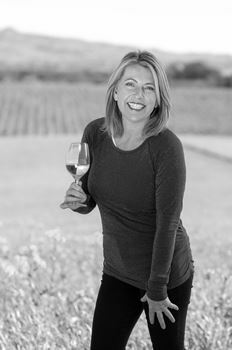 The experience with Kendall-Jackson and mentoring from then head winemaker Jed Steele (Steele Wines) laid a solid foundation and taught her key winemaking concepts. Jed has since become an 'inspirational character' within her wine industry circle. But Sara was no stranger to agriculture. Her family has owned and operated a 400-acre organic ranch dating back to 1884. Though she initially studied art upon entering the college ranks, Sara took a year hiatus from school and lived in Mexico on a sailboat where she reflected on a future career. There she decided to redirect her passion, pedigree and expertise back into viticulture. Upon returning stateside, Sara helped her family plant wine grapes on their organic ranch. She took an active role in their new venture and at the same time, served as an enologist assistant during crush at Kendall-Jackson. From these efforts, Sara decided her new focus would be in the wine industry as a winemaker. Sara applied and was accepted to Fresno State. She doubled as a student and research assistant for the Viticulture Enology Research Center (VERC). Upon completion of the program, Sara worked for seven-plus years as the associate winemaker at Franciscan and Mt. Veeder Winery under Larry Levin, where she honed and perfected the craft. Through her tenure at Franciscan, Sara worked abroad during the 2002 harvest season in Chile for Veramonte. She also had the honor to work with world renowned wine consultant Michel Rolland, where she gleaned from his experience and knowledge. She also played a role in the terroir-driven Bordeaux blends of Quintessa and Estancia from 1999 to 2002, where she was able to utilize her talent for blending and creating Meritage wines. Known throughout the Napa Valley as a master blender, Sara has brought along a wealth of knowledge and creativity into the cellar since joining Peju in 2006. Sara's passion for Bordeaux varietals and knack for innovative blending make her the perfect fit to lead Peju's winemaking team. Her artisic approach towards crafting wine focuses on taking the best components from the Peju estate vineyards and blending them to create the finest possible finished product. In September 2007, Sara headed Peju's efforts to gain organic certification in the Rutherford Vineyard and she is overseeing the winery's sustainable farming efforts in the Persephone and Wappo Vineyards with organic certification goals in the near future. This method of grape farming not only preserves the land and creates balance in the vineyard, but it also enhances the quality of the fruit.